Stay up to date with Kamailio and SIP – Register for the SIP Update today! 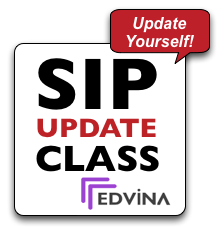 Edvina launches a new training class for all students of the Asterisk SIP Masterclass and the new Edvina SIP Masterclass – the SIP Update 2013! This new class will update you on the latest features in the coming Kamailio 4.0 as well as some new features in the SIP family of protocols – like MSRP, SIP Outbound, GIN and much more. The class is a three day class with labs that quickly gets you up to date with Kamailio and gives you input on how to improve your own platforms. Teacher is Olle E. Johansson, with over ten years of experience of Kamailio and Asterisk, as well as more than 15 years of experience in teaching, working as a consultant building large scale platforms and doing development in both projects. We have a limited amount of seats in this new class – make sure you register today!